Another sculpture in the shape of an archetypical flying saucer. This one was built by Canadian artist Ben SMIT. 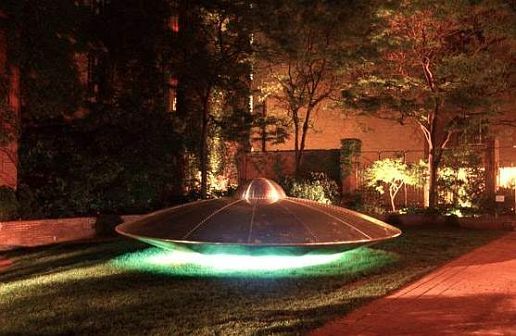 It is pictured here at the Toronto Sculpture Garden where it was featured during the Summer of 1999. The sculpture is about 6 m (19.7 feet) in diameter and was constructed of a plywood frame covered in metal.